Years ago a neighbor who has since passed away gave me some trees he received from the Arbor Day Foundation. One survived those early gardening days, my learning curve a steep one. Fast forward into the present. Only twelve months or so ago did I endeavor to identify what turned out to be a Bradford pear. How fitting, I thought, since that is the tree Harold wanted most of all. And it is beautiful in the spring. Just yesterday I photographed the sundrenched upper branches. Now I come to find out that an early demise is the trees’ best attribute. Developers were wrong in thinking this prolific flowerer was sterile. They can cross pollinate with every other pear tree in the environment. And their offspring revert to an invasive thorny hedge which chokes out native species. My partner found an article titled The Curse of the Bradford Pear. Lovely, huh? And simply typing “Bradford Pear” into Google immediately triggered “invasive” as a search suggestion. I found articles from Missouri, Pennsylvania, the Carolinas, and more. How I’ve missed this news for so long is a distressing mystery. Horrified, we will probably spend a few hundred dollars to get this house-high beast removed as soon as possible. I’m sure not willing to tackle the project. And to think our own US Department of Agriculture introduced this plant, a fact I readily discovered. I feel betrayed yet again by our wonderful government. One minor bright side is that we now have space in our small yard for something native that will benefit local fauna and hopefully thrive for many years in our heavy clay, high alkaline soil. Any suggestions, fellow gardeners? 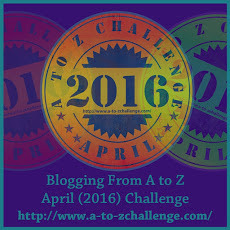 In happier news, tomorrow begins the A to Z Challenge. I hope you’ll join the fun! I like lists. They help organize my thoughts and keep even the smallest goals on track. I also hate to waste paper. So I purchased a modern alternative - a dry erase board. Unfortunately the dry erase marker that came with my renewable resource dried up and none of the new ones would fit in the provided holding clip. Having three colors is great but made storage options even more elusive. For several days I've left them on the table near my front door. That furniture is mostly decorative and does not have a drawer. The result? An eyesore. I wanted an alternative. Inspiration struck just today. And hence the company name in my title. Velcro's wonderful fastener solved my little issue. We bought five feet of the stuff years ago and never regretted it. The two-part product has so many uses. And here is another. Voila! I attached the most commonly used black marker at the top (obviously) while the red and blue are situated on a clear plastic tab meant for hanging the board (I'm using the magnets with my metallic garage door). At lest you know I'm making an effort to exercise! Do you have any organizing tips to share? I would really appreciate incorporating new tricks. No time like the present, right? Well, that little task made me realize that I never updated my National Novel Writing Month winner's badge. Silly me! November was ages ago. At least that has been done at last. Thank you to the Offices of Letters and Light for the image's ongoing accessibility. Meanwhile I decided to set a theme for this year's challenge. I've written little blurbs about music groups represented in my collection. For fun I also concocted names for bands and an equally imaginary factoid. I hope you'll join me. Do you plan to embark upon the blogging challenge? If so, let me know in the comments and I'll make sure to stop by. The Bald Eagle Cam is Back! Click to check this Pennsylvania Pair! I have to be honest. Despite much good fortune it’s pathetically easy for me to wallow in regret over misspent youth. Oh, I didn’t end up in jail or anything. In fact, I’ve always been a (basically) upright citizen. Yet throughout the decades I drifted from job to job, going wherever the local temporary employment service sent me. I almost always ended up permanently on some company payroll until that business got bought out and my position came to a premature end. Then the cycle would repeat. My current life is not awful, by any means. My partner likes to phrase it like this: “We could have crash landed in a worse place.” So true. It simply feels like I missed out on years enjoying a fulfilling career. And my hometown isn’t exactly exciting. Yet I saw something the other day that brightened my mildly mournful attitude. I am Mighty! Hear Me Roar! Besides brightening my day, the little flower reminded me that I’m still alive. Boring as my small suburb may seen, the place could very well have more surprising blooms left. So might I. And thus I got myself outside and made way for summer growth today instead of feeling lame. How about you? Do you like to garden? Maybe something else draws you out of yourself. Please share with a comment.